Well Hello! 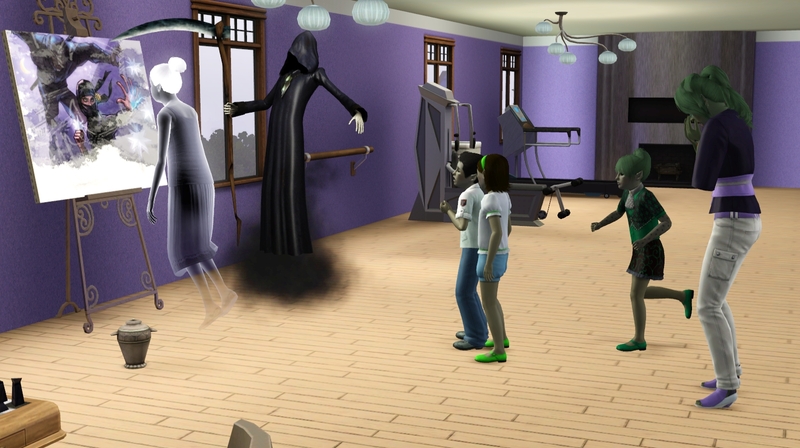 Exciting times in the Sim Universe with the long awaited release of TS4! 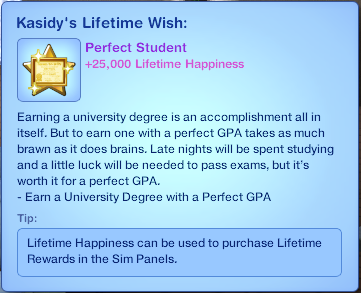 I’m enjoying it, but I’m glad I’ve decided to complete this challenge in TS3. 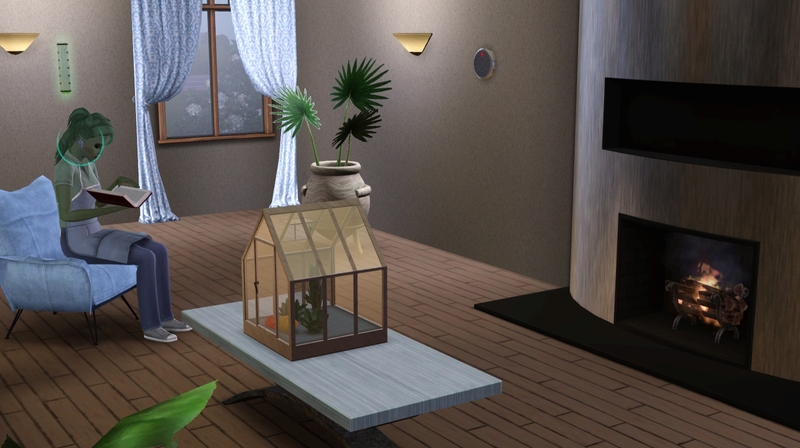 Last time, the house in Lucky Palms became unplayable, so I moved it to Isla Paradiso, which had horrible lag… so I uprooted the family and built a new house in Twinbrook! They’re finally all settled, so let’s get started! Tahiya and Kahless being adorable. 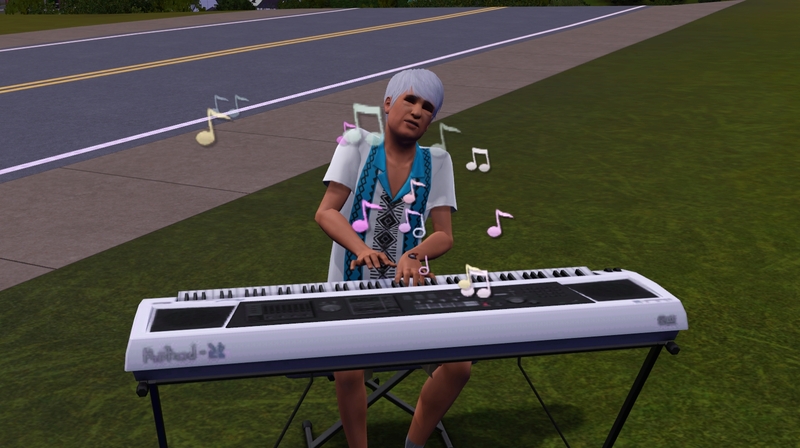 Ike is still playing the piano in the yard. But hey, whatever the old guy wants. Juniper is working out, per a wish she’d rolled. 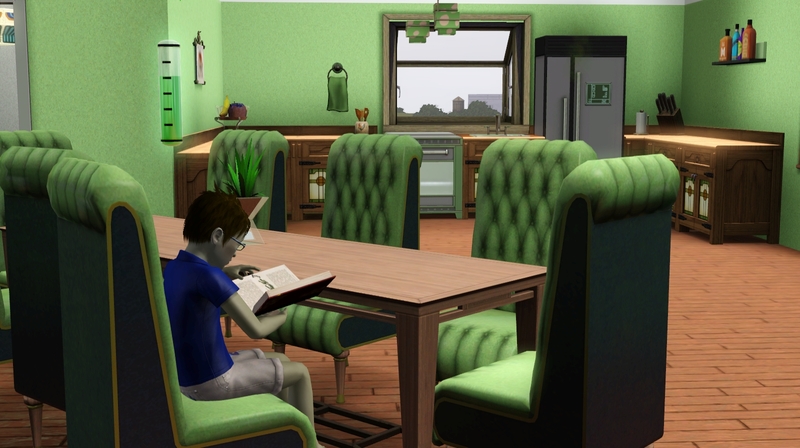 Krypton is reading a book in the new kitchen. 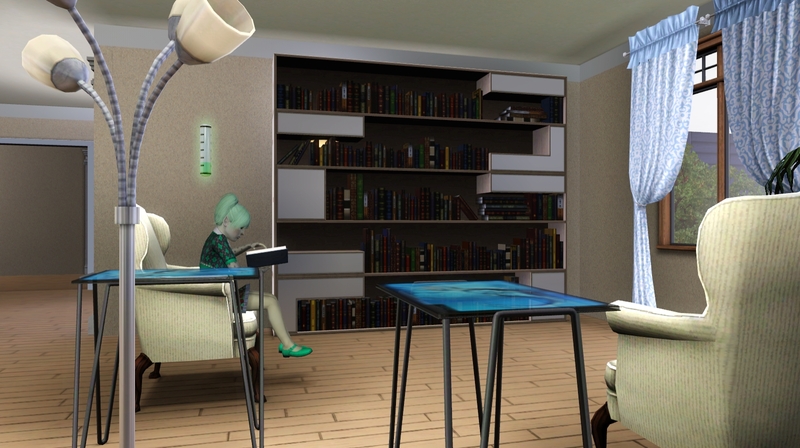 It was a little too green – I changed the walls to more of a yellow shade eventually. Here’s little Kira on her way to play on a computer. Kasidy found the reading nook I built and grabbed a book. And Keiko the Creepy is climbing out of the toy box. 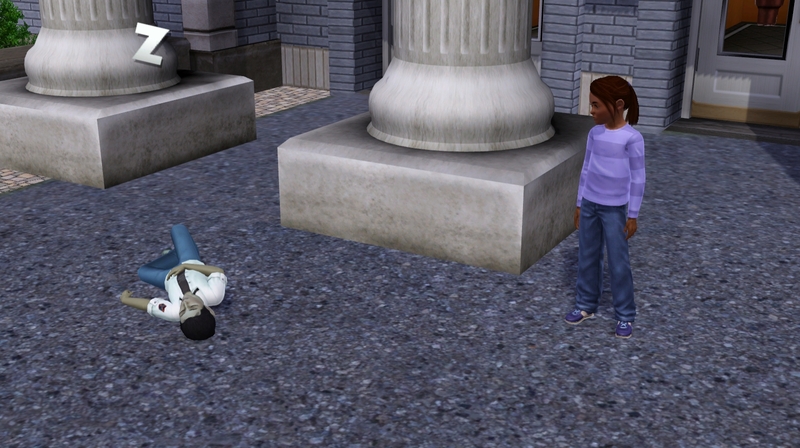 Twinbrook is darker than the other towns we’d been in lately – I’m going to have to get used to it. 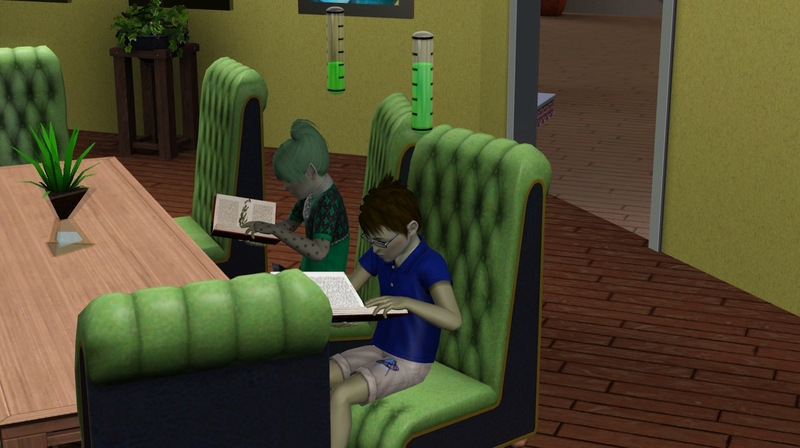 So Juniper finishes teaching her the old fashioned way. The little thing can be kind of cute sometimes. Juniper gets the babies all fed, tidied up, and asleep in the new nursery. I’m pleased with the way the new house has turned out – especially since I was incredibly fond of their old one. 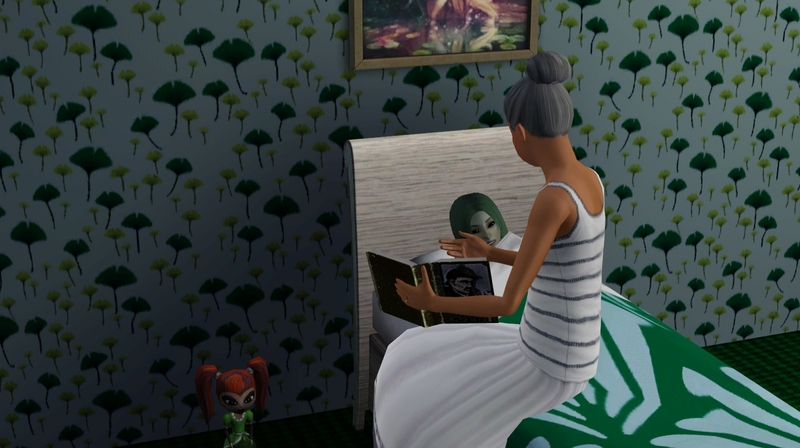 Kasidy gets a bedtime story from grandma. In her own new bed! Krypton also found his new bed! Wow! Kira found hers too! How could there be bad food already? I just bought that fridge. 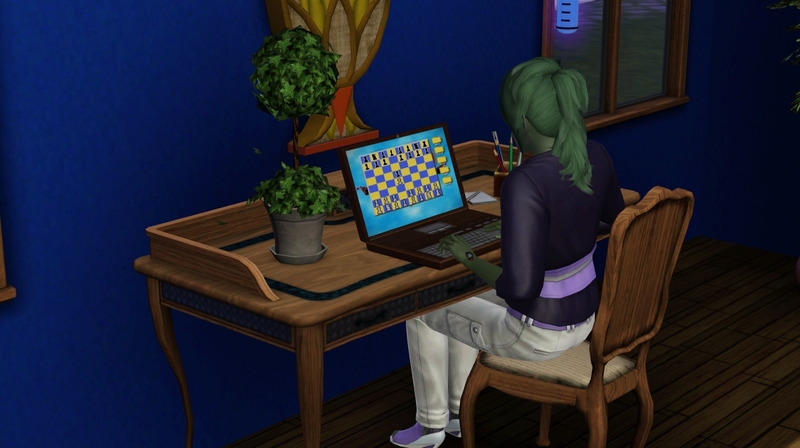 Chess in the new study! Lucy Ferne and Tim Burre (har dee har har) have a chat on the lawn. Juniper made some eggs with watermelon (disgusting!) for the kids before they head off to school. The little guys and their family breakfast is adorable. All taken care of for their first day in a new town! Juniper takes good care of all of her babies. Yay! Juniper is FINALLY off to her first day of work! New fancy fridge, step one! 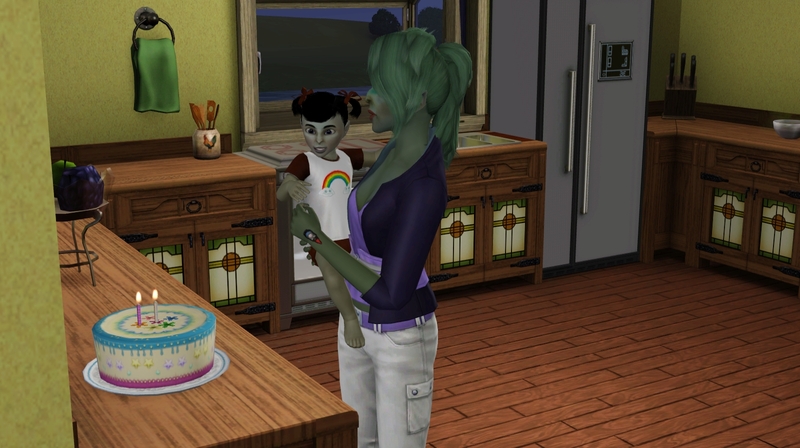 It’s Krypton and Kahless’ birthday, but Juniper is at work, so they won’t get cakes or a party. 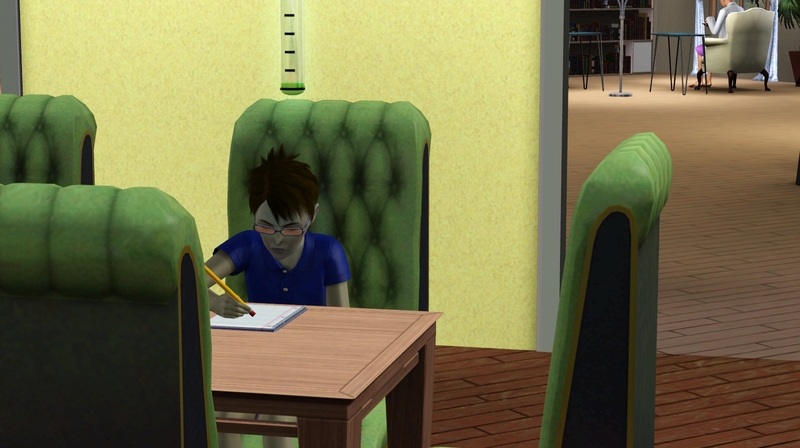 I wish I could tell Krypton he didn’t have to do his homework. I don’t think I’ve seen it before, and it sounds pretty easy – I locked it in for her. She’ll be a spare, but still. Kira also rolled HER LTW after completing her homework. I opt the family out of the celebrity system here in a few, otherwise she might have been able to complete it herself. 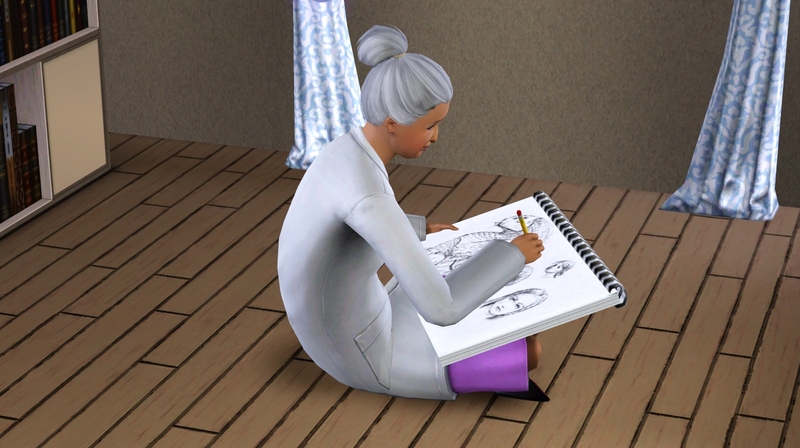 I found Tahiya sitting on the floor working on some sketches. Old man Ike just got home from work. And then it’s time for the floor birthdays to begin! Kahless rolls dog person, which he adds to loner and clumsy. Here he is! Isn’t he adorable? Yes he is. It will be a challenge to choose between him and Krytpon! I’m looking forward to the poll. These little tykes are quite the readers! There is a giant TV in this house. I loved his childhood look. I’ll miss it when he’s a teen! Krypton had athletic locked in, which joins neurotic, eccentric and genius. He’s pretty cute! And has normal shaped eyes! 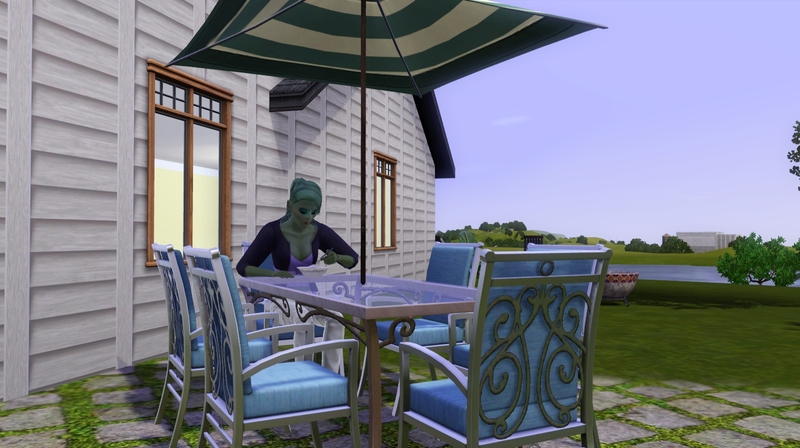 **TS4 Interlude** This is where I was when TS4 came out, I played several hours now, and have an interesting household with a slutty woman with the serial romancer LTW (or whatever it’s called in TS4) who has a son who interferes with her woohooing of random men, so she frequently makes him go sleep outside on a park bench. She asks everyone she woohoos with for a loan to bring in money. She’s basically a prostitute, but I’ve been having fun with her. 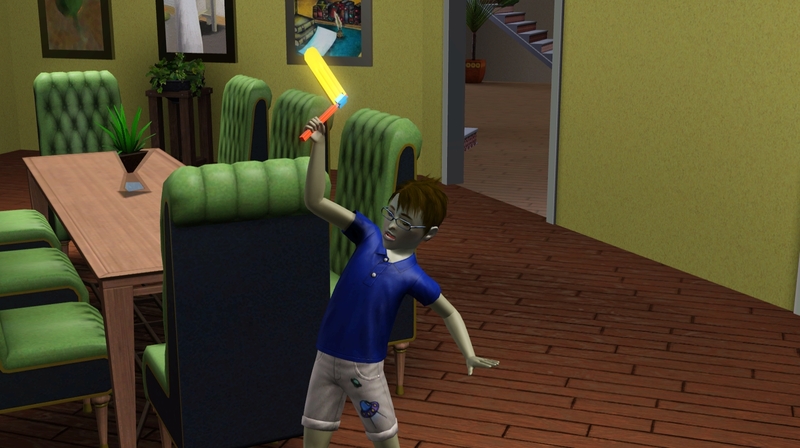 Even if it was THIS toddler. 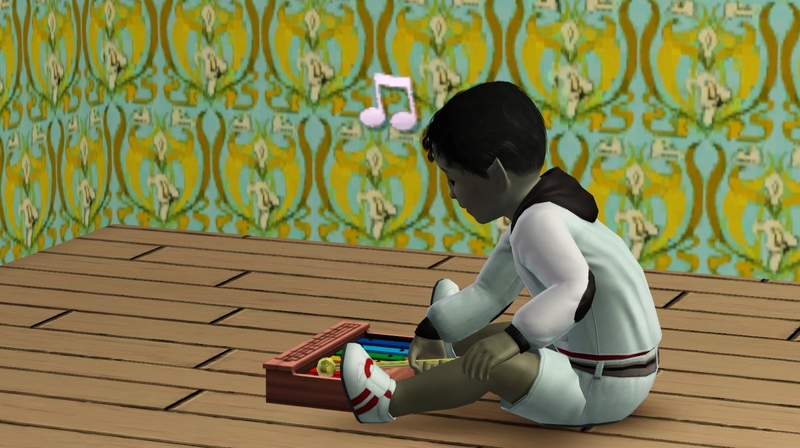 I didn’t think the toddler thing would bother me, but I was really happy to have them back. Juniper enjoys the new living area. I never bother giving children and teens athletic wear makeovers, since they hardly work out… hence the bacon and eggs tshirt. I put this fancy sauna thing in the basement. I’m sorry the pictures are so dark. I was trying to avoid what I’d had in the last house, which was the nine million ceiling lights – I could lighten them before posting, but UGH so much work. I’ll figure something out. …I opt the family out of the celebrity system. Goodbye Tim Burre of the paparazzi. Let Ike play in peace. Aw man! 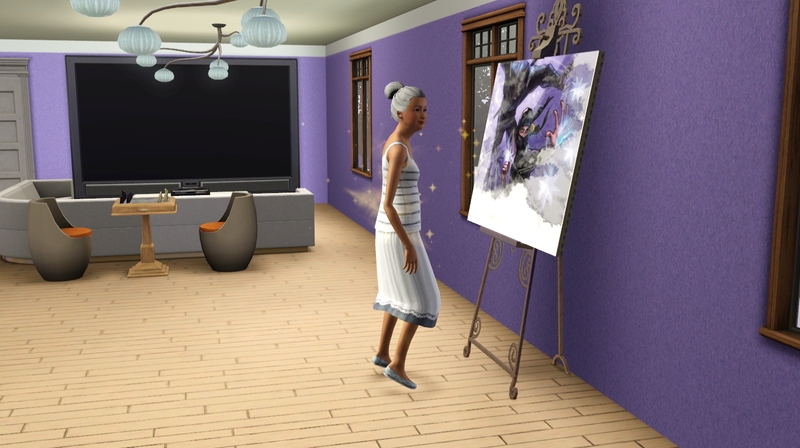 She was in the middle of a pretty epic painting! Thanks for bringing your very strong genetics into the family! (Even though they aren’t being passed on) I wasn’t super attached to Tahiya, but I’ll miss her tottering around the house. She was pleasant and helpful. Oh hey! I just noticed! Krypton has “brain power” instead of energy – making him a true alien! On this lovely sunny morning, Juniper enjoys her fruit parfait on the patio. All the kids have scurried off to school. Juniper frequently has a lot of free time, so we started a garden. I’m going to have her run around and collect seeds when she’s done here. Oops, this one is a real fail. … Kasidy is right behind her! We have a guest too! I don’t know who she is. Wait… I just remembered her name was Zo. 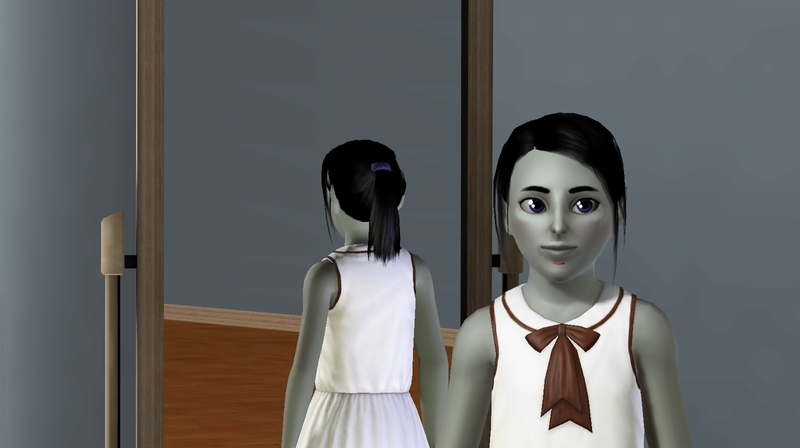 Kira rolls mean spirited to go with heavy sleeper, bookworm and grumpy. She sounds like a real joy. 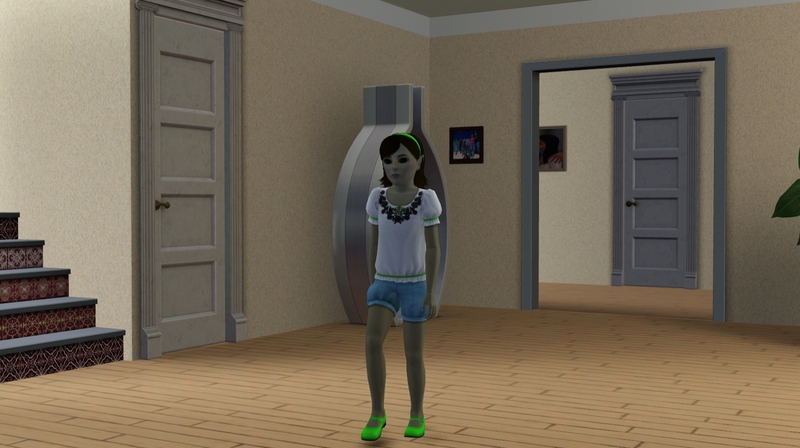 She looks nearly identical to Juniper, just with black hair. 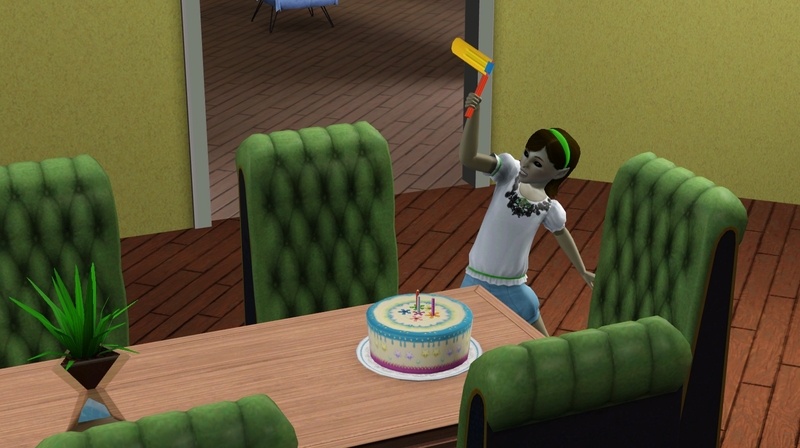 Little Keiko is also having a birthday today. 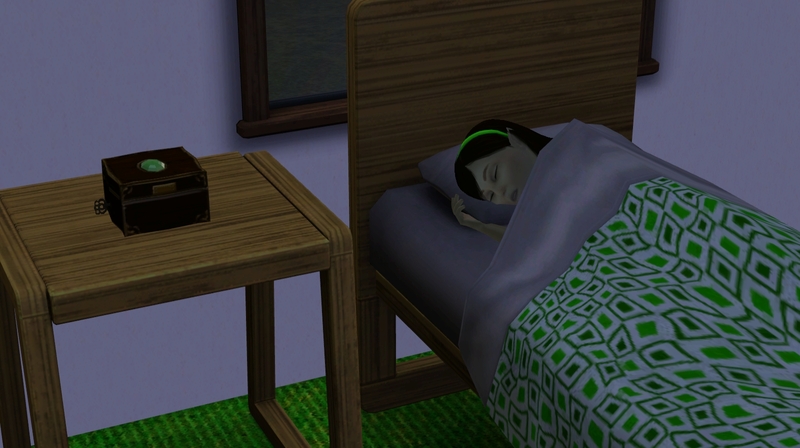 Technically all of the girls’ birthdays were tomorrow, but Juniper has to work tomorrow, so I planned ahead this time! Kasidy rolled absent minded to join genius, eccentric and clumsy. Very different personality than her twin! She also looks nearly identical to Juniper, but for some reason I like her more. Weird. Oh, both twins are full aliens with “brain power” instead of “energy”. Keiko rolls absent minded to go with genius and loves the cold. LOOK AT HER! SHE HAS THE POX! Poor Kahless has cried the longest, hardest, and most frequently for his lost grandmother. And then, like all good parties – it ends with a broken appliance. And here’s as good a stopping point as any. I realize it’s rather short for me, but there’s much to play after this point without a lot happening, so that seemed like a good place to start a NEW post, rather than drag this one out for ages. I also have a bit of a predicament. Juniper was almost all the way to full on adult, but the move reset her. Should I age her up? Maybe on the next kids’ birthdays if I remember? Let me know what you think. 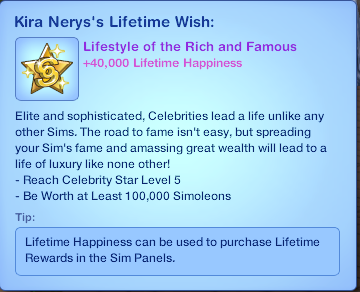 Until next time, Happy Simming! 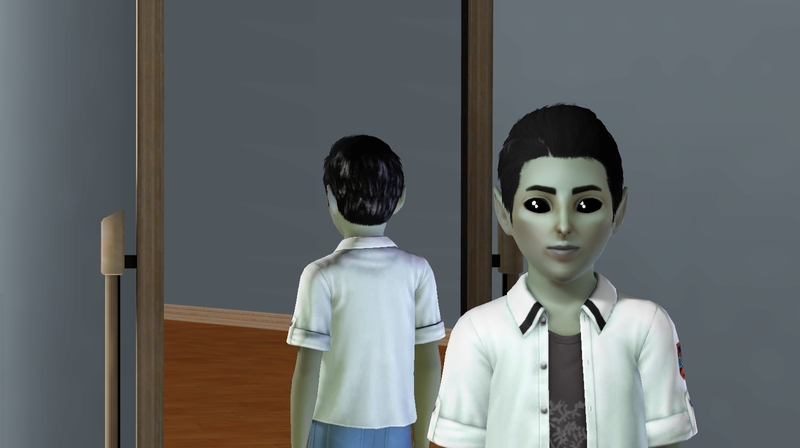 This entry was posted in Generation 10 - J and tagged Alphabetcy, I'm Surrounded By Idiots, ISBI, Juniper Zale, The Sims 3, Zale Legacy on 09/03/2014 by Heather. 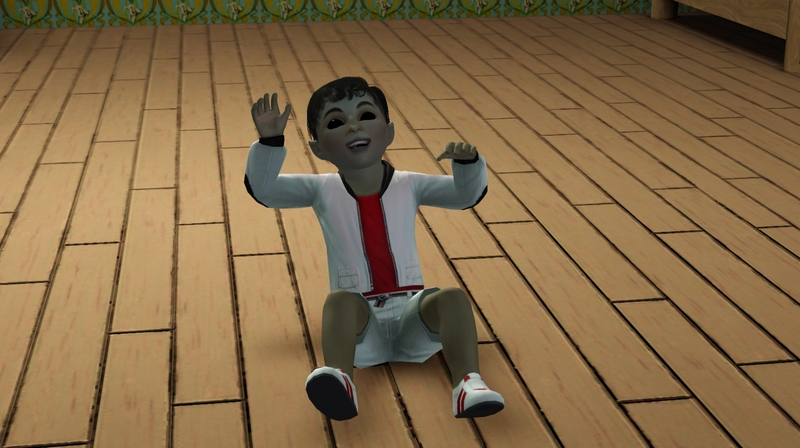 OMG, one year old and already 10 generations in? You are simply powering through! I hope I can get through mine half as quickly as you do. 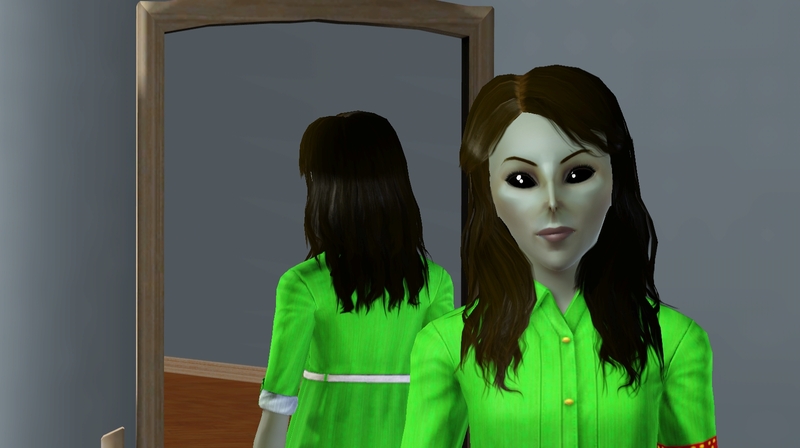 Wow, Keiko is so freaking scary – though I do love her name. And she almost had Ike! You were right to warn him about running. But she is cute as a child. I kind of want to have a human with those ginormous eyes, they’re funny! Was Krypton blinking, or does he really have squinty eyes? I don’t think I’ve seen those since Abe’s gen! I say yes, age up Juniper. Otherwise you’ll end up with both Juniper and Krypton as YAs! She should be at least one age group ahead of her eldest child. 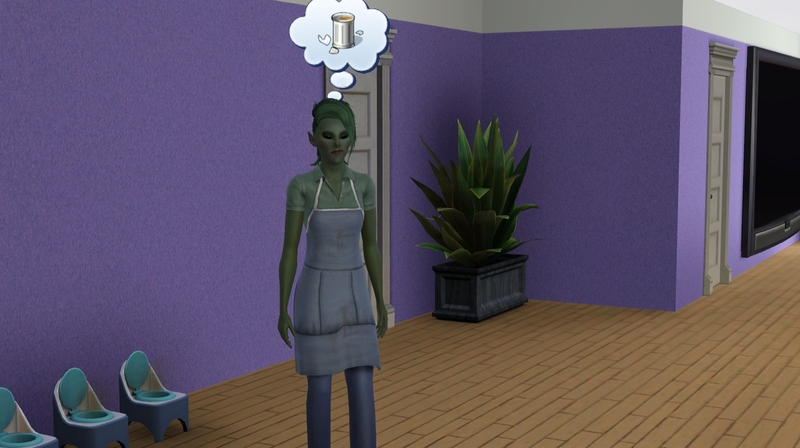 Personally, I’ve not had the issue of resetting ages, but it really annoyed me when I had an immortal vampire who got to be younger than her alien offspring. It’s just creepy. 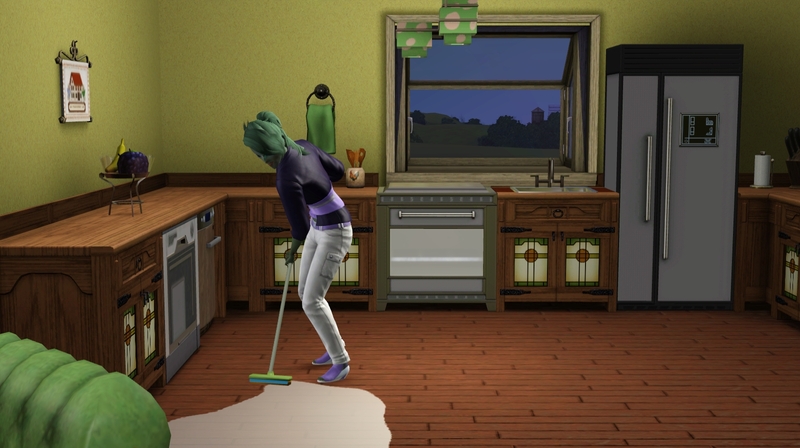 So you’re enjoying TS4? I’ve read quite a few reviews where people liked the new CAS and Build Mode, but hated the gameplay. 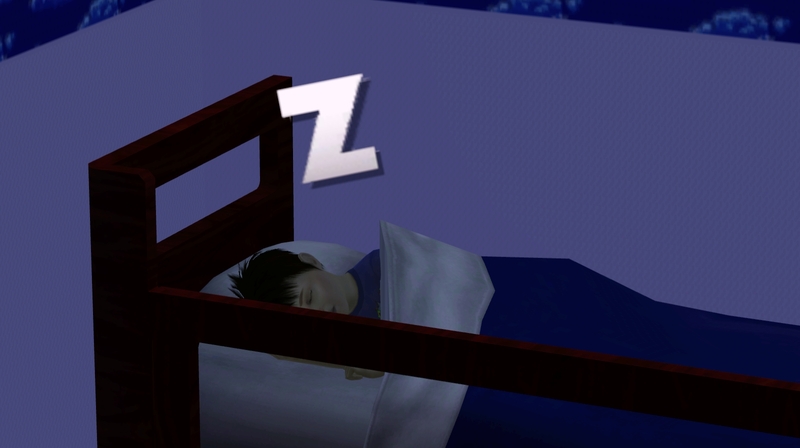 Of course, it’s really early on, but many people are complaining about the tiny worlds and feeling boxed in compared to TS3. 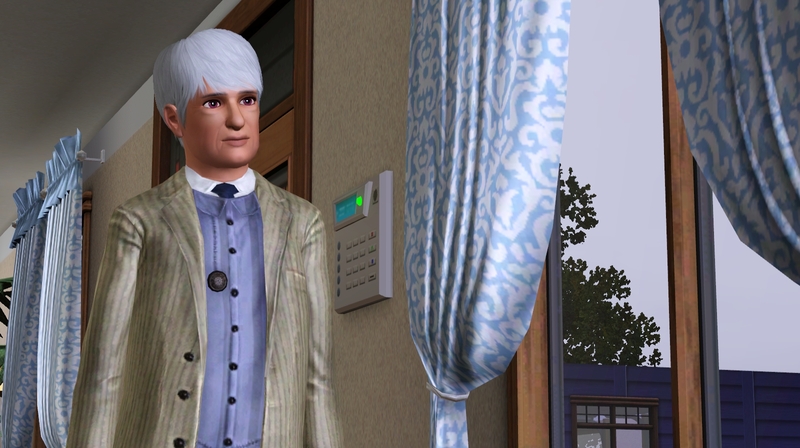 Glad to know that you think of TS3 as coming home – means we won’t lose you too quickly! I know, can you believe it’s been a year already? The time has flown by! I don’t feel particularly speedy – but I guess we’re doing pretty good! Keiko is a pretty cute child – the ginormous eyes are pretty funny on a human! Krypton was maybe blinking a little, but I think he has his Chinese fathers smaller eyes. I will age Juniper up when I remember to do so, ha ha ha. Pretty soon I think. Yes, being younger, or even same life stage as your children is pretty strange! 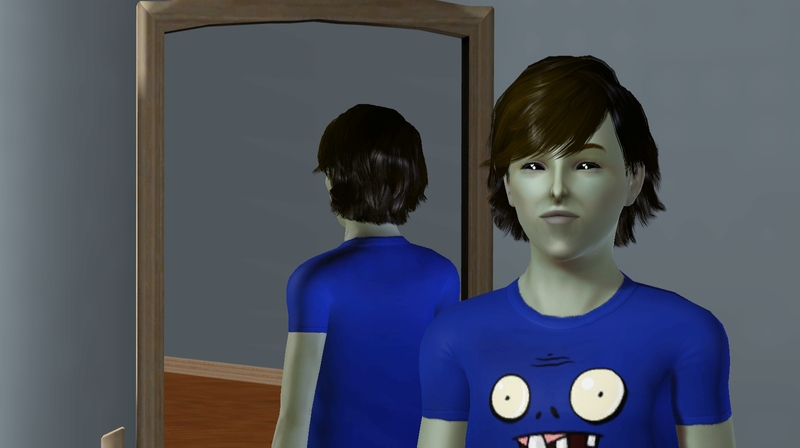 I do like TS4. 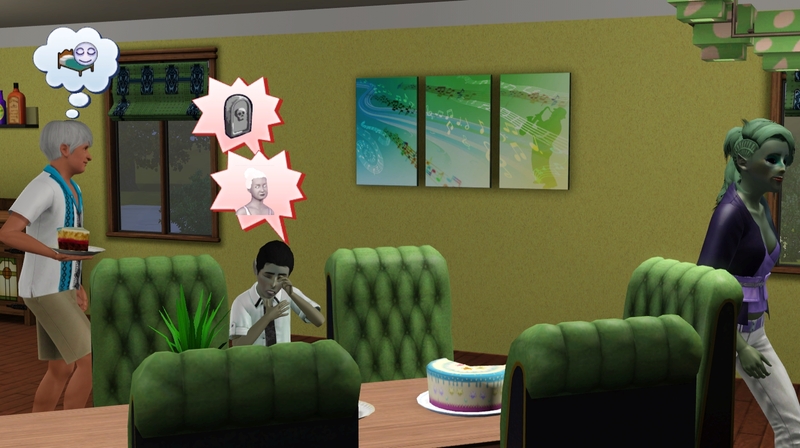 I have a baby glitch (mine look like demons) and I have had a crash happen… but the worlds are pretty small… I think game play is kind of cute, but it takes FOREVER for them to eat a meal – especially if they’re talking, but even if they aren’t! I’m also not super pleased with how quickly they get upset about something. 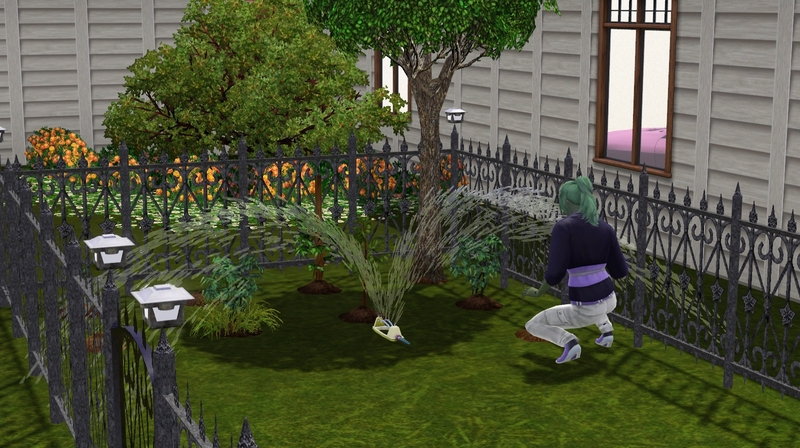 But I think the Sims themselves are adorable, and a lot of the actions are pretty cute. Lots of new ways to interact. But yes! 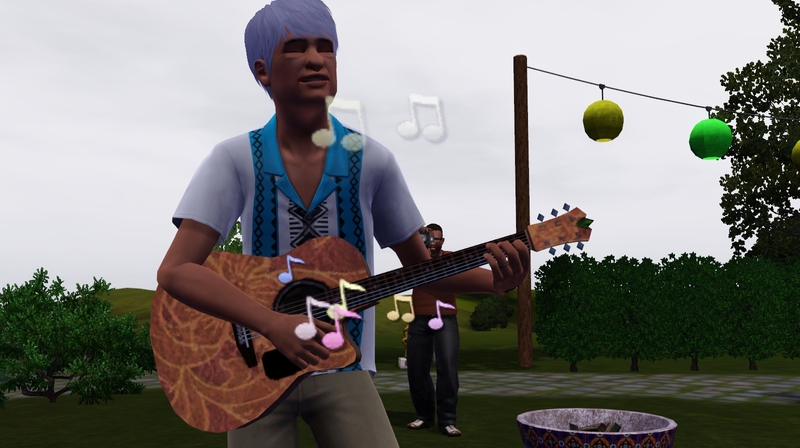 TS3 was so lovely to get back to. You won’t lose me! I can play both! 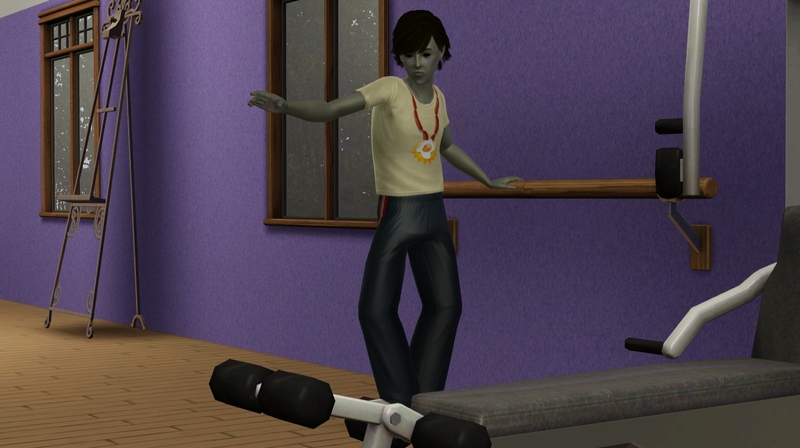 Especially since I’m not documenting a TS4 challenge. That is epic. 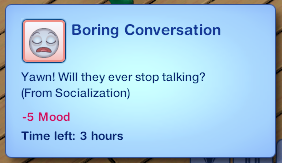 I’ve never had a boring conversation pass out before! I didn’t even know those existed. I’ve had lots of cowardly faints but nothing like that before! 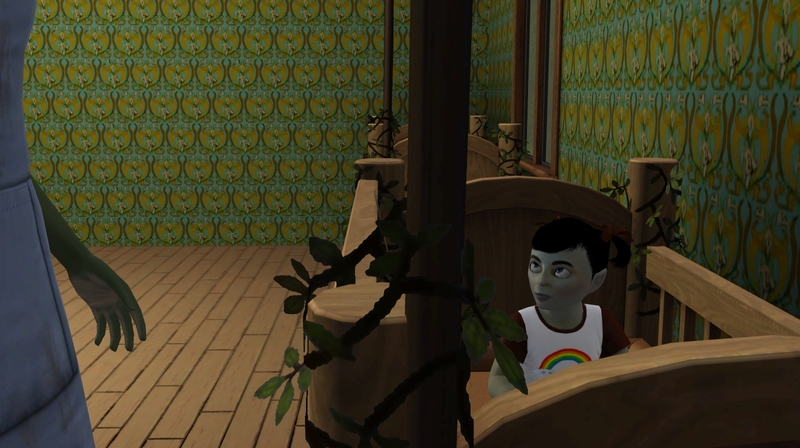 I’m glad they’re getting along better in Twinbrook. It’s funny how some towns are darker than others. I’ve noticed that Hidden Springs is much darker than Sunset Valley. I’m getting so excited for the heir poll. The decision keeps getting harder x_x. Ha ha, how funny – yeah, if you’re actually watching them at the time, the queue up “Bored to death” then pass out – thankfully they don’t actually die! Yeah, that Midnight Hollow (or whatever it’s called) is especially dark! I’ve just been spoiled by how bright Lucky Palms was. There’s some benefits to sunny towns! Aurora Skies was super dark too. I think both the boys are pretty great, so I’m not concerned who will win! Both boy Zaliens are looking good. I’m dreading the heir poll because I don’t know if I can choose!! Nice to see that Juniper FINALLY went to work. 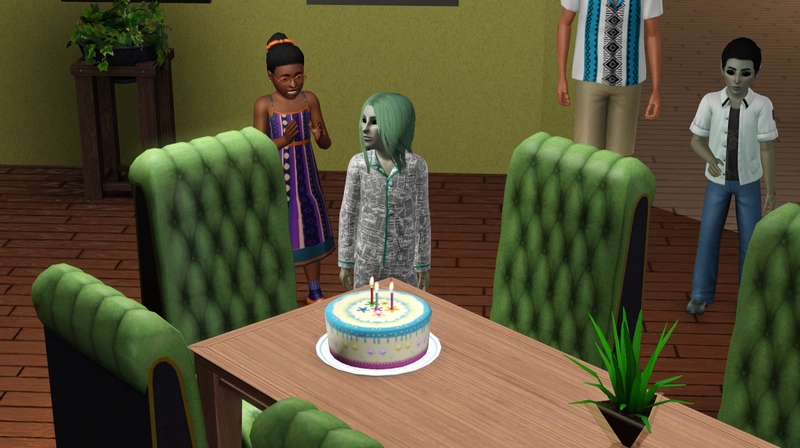 As for her birthday, I think you should age her when you feel like she needs to be aged up. Great update as always, can’t wait to see what the Zaliens show us next! Wee! 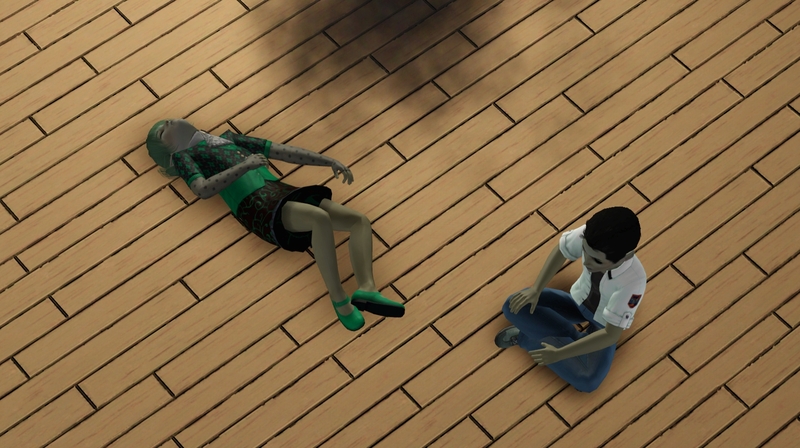 It’s so good to see my (sim) friends again. 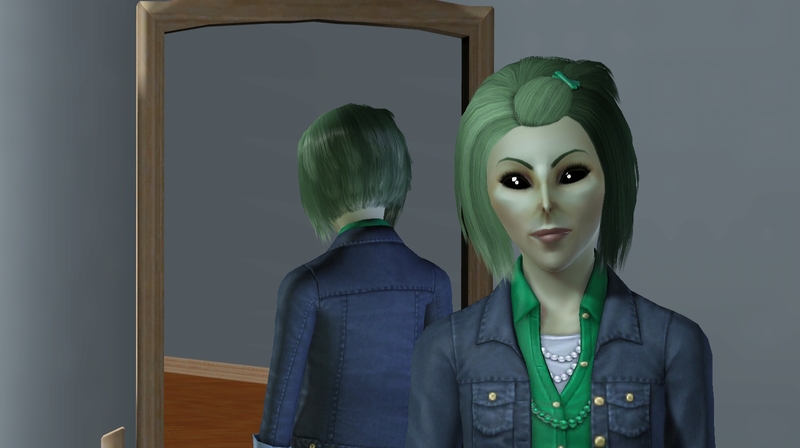 I loved this chapter, its so fun to see the weird Alien genetics! Aw, you’re so sweet! I hope you’re doing well! Not to add guilt to your struggles, but I’ve missed the Cultrics! haha no no its good to get a little motivation. Its better than sitting and wallowing in self pity over here. Has it really only been a year? It seems like longer (in a good way). Not sure who I fancy as heir this time, none of them have really grabbed me yet. You’ve set yourself a challenge now. Ten generations in the next year, too.